the view inside our refrigerator after the Passover cleaning! after clearing out the `chametz` a shelf is free for the Matzah! It happens so fast once the first blossoms start to open. The approaching weeks before Passover also have that same excitement as we are coming into the season of new life and Resurrection. Passover and Cherry Blossoms come around at the same time. God`s plan is so perfect, and there are reasons for His seasons! 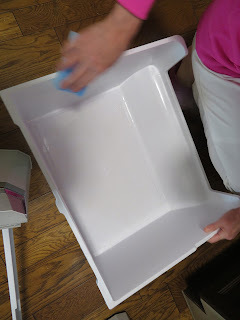 When doing the Passover cleaning I have a kind of desperation to go into those deep corners of the cabinet and the refrigerator to get out each crumb and dust that is accumulating. Then it becomes like a race to get the hametz (anything with leaven) out of the house and clean the cabinets before the blossoms fully open. Just when you just want to be outside all the time, you know that you need to clean out the `hametz` which takes some time indoors. When I was cleaning I realized this bit of wisdom---you can`t clean with a dirty sponge. In the same way, when our heart is full of `dirt` and `sin` and we haven`t sought God to clean our heart, and we bring all that into our lives, it is a little like that isn`t?! Well, calling our hearts a dirty sponge sounds a little strong, but as I think about it...well, yecch, it is! We keep collecting the dirt and our hearts are like that sponge, and we go about life not even knowing how ...well..how dirty it is. I had no idea until God showed me through Yeshua!! It will be exactly four years ago tomorrow that I was saved through Yeshua! I just realized that while writing this, this year it will coincide with Passover! God cleans out our hearts, like the way we look into find the `hametz` in the cabinet. He searches our hearts and makes us clean!! That is what God does through Yeshua, the unblemished Lamb who is the Passover Lamb who came to take the sin of the world!! flowing from the throne of God and of the Lamb down the middle of the city`s street. The message of the gospel is so simple and beautiful. We are like that sponge, and we need to be made new (as in my metaphor of the cleaning when we can`t get anything clean with the dirty sponge) and often we don`t even know it! But God knows that. He made us. He knows us. And He loves us. That is why He gave us His only Son who died for our sins.